Here's a good storyline for The X-Files. In the second half of the 19th century, a group of aliens decides to take over the Earth. Sensing the authority of the Church of England, they decide to use this institution to disguise themselves. They will build apparently medieval churches to use as cover for their headquarters on the planet they hope to conquer. One alien finds a book of medieval architectural styles. Norman looks nice. They decide to build Norman parish churches so that the populace will think they are Vicars and choirboys, not aliens. Of course, it all goes hopelessly wrong. By choosing the Norman style they have blown their cover wide open. They can just about get away with the doorways. 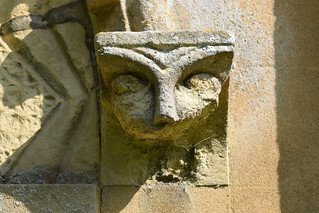 But the collonaded windows begin to raise suspicion, and once you get inside the churches it is all pretty hopeless - the Norman stone pulpits, Norman stone lecterns, Norman pews, they are all sad and laughable. The aliens are exposed, and sent packing. 19th century restorations in the Norman style are almost uniformly horrible. 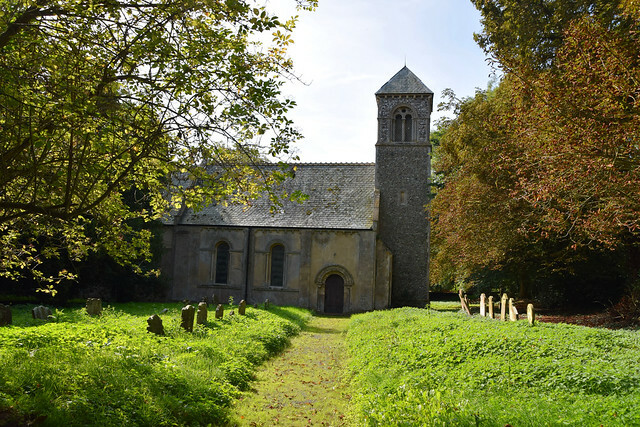 By the early years of that century, many of Suffolk's churches were in a poor state, but to rebuild some of them in the Norman style was a dreadful mistake, and nowhere in Suffolk was the mid-century rebuilding as comprehensive as here at Stoven. Nothing looks less organic than a mock-Norman building. 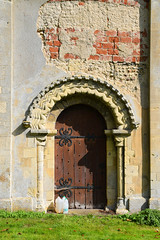 Here, the fine Norman south door has been used as an inspiration for the rest of the building, as if a new body had been cloned from a single cell. At first sight, it isn't so bad. 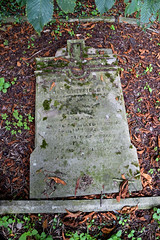 The graveyard on the north side is delightful, full of mature trees and 18th century headstones. The shape of the building is good, especially with the sun behind. It is only on approaching that the details make themselves known, and there seems to be no relationship between the styling and the proportions. And where did that tower come from? But there is a heart-warming story here that is worth telling. In April 1987, this tiny parish was presented with a horrific £200,000 bill for repairs. The Diocesan architect, aware that this was an impossible demand, recommended that the church be partially demolished, enabling the parish to continue using a smaller, fitter building. 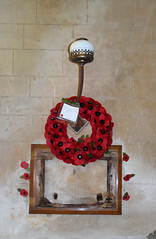 Funding bodies and charities like English Heritage were unable to help, since the building was only listed at Grade II, and wasn't considered important enough for injections of cash. Not surprisingly, the Parish Council decided instead to opt for making the building redundant. That way, they could move in with neighbouring Brampton, while the Redundant Churches Fund took over the headache of paying for repairs. The building would be lost to CofE liturgical use, but would be retained as a village landmark, and could also be used for community purposes. 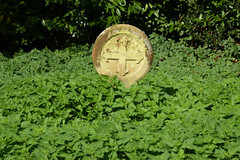 The church was declared redundant in January 1989. However, there was bad news ahead. The Redundant Churches Fund decided that the 1854 rebuilding had been so drastic that they could not justify taking St Margaret on. Simply, there was just not enough medieval structure left to justify the expense. The Parish Council asked the Fund to think again. They did, and came to the same conclusion. So St Margaret was put up for sale by the Diocese, pending planning permission for residential or commercial use. Unfortunately, nobody wanted to buy it. This should really come as no surprise, since few people would be prepared to splash out a six figure sum just to make a structure sound, before even thinking of converting it. The majority of churches sold off during the great wave of redundancies ten years earlier had mostly been in good condition. And now things got desperate, because included in the legislation that governs church redundancies is the clause that, if no no use has been found for a Grade II building within three years, it must be demolished. Those three years went by, probably rather quickly in the eyes of the former Parish Council, and in May 1992 the Church Commissioners prepared the draft order for the demolition of St Margaret, Stoven. This must have been a depressing time for villagers. They were presented with something of a <i>fait accompli</i>, but in any event a public meeting was held to discuss it, and representatives of national bodies like English Heritage and the Redundant Churches Fund attended. It was agreed that if there was any way forward it was through a thorough architectural examination of the church building. Well, you may be able to guess what happened. It didn't take long to discover that to all intents and purposes this was a medieval building - rather than being demolished, the former church had been covered with a Norman skin. 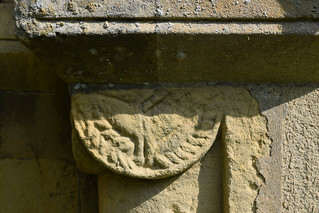 You can see this for yourself; the plaster has been removed in places on the south side, exposing the outline of the medieval window splays beneath. As a consequence of this, the listed building status was raised by the Department of the Environment to Grade II*, and suddenly things looked a little brighter. 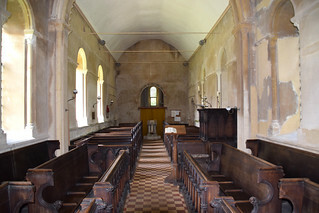 In the short term, the new status qualified the building for English Heritage grant aid, and in the longer term the parish decided to refer matters back to the Redundant Churches Fund, which in the meantime had morphed into the Churches Conservation Trust. And then something extraordinary happened. The survey for the newly-funded repair work showed that the total cost would be about £60,000, less than a third of the figure quoted six years earlier! You have to wonder quite how such a disparity occured, and if events would have been so traumatic if the revised figure had been quoted to the parish at the time. Suddenly, it seemed as if Stoven parish might be able to cope after all. At Easter 1996 the church opened for business again. The Redundancy order was rescinded, and a new Parish Council convened. Since that time, work has continued on restoring St Margaret to former glories. 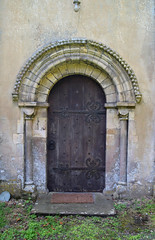 And as an act of faith the door is open to visitors every day. When I first came this way in the late 1990s, I remember stepping in to an interior that was more pleasing than the exterior had led me to expect, and not wholly mock-Norman in style at all. 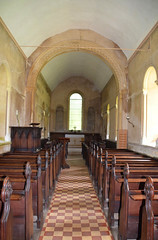 The chancel arch is more restrained than some 19th century confections, the east end of the chancel is elegant, the tiling polite and the benches plain and fitting. Indeed, those aliens so nearly got away with it. 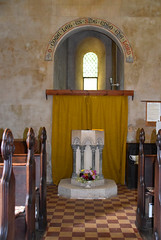 They obviously leafed through the medieval architecture book to the Early English section for the font and the pulpit, both of which are more imaginative than many in that style, and most people nowadays would find the intimacy of this narrow building more attractive than the usual wide-open spaces so beloved of the Victorians. Coming back over the years, and most recently in the summer of 2017, not much has changed. Clearly, a bit of redecoration is now needed, but there's the makings of a building seemly and fitting for Anglican worship here. Two curiosities, and they are not unconnected. The war memorial has gone. I remember it as being a brass plaque, but only the broken wooden frame remains. Has it been stolen? 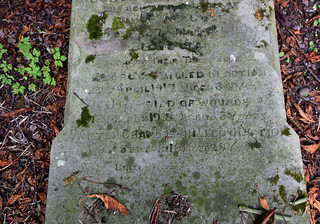 And outside under a tree I found the fallen headstone to George Whitfield Cole of 1910, which is of interest because it also bears the names and dates of his three sons who were all killed in the First World War. The people of Stoven must feel a sense of relief that they still have a parish church in the village, but the real irony I suppose is that it isn't how original the building is that matters at all. The Victorians restored in medieval styles to create a false sense of continuity, but the continuity is always there anyway. It lies not in the bricks and mortar but in the people of the parish who have used St Margaret as their touchstone down the long generations, both as Catholics before the Reformation and as Anglicans afterwards. Outside St Margaret, some of those people still lie in the ground. Cardinal Newman defined tradition as the unending, slow process of development, and buildings like churches should always be changing to suit the communities that use them. Our understanding of God, the Universe and everything changes and develops from one generation to the next, and this will inevitably be reflected in the buildings in which we worship. If that sometimes involves razing them to the ground and then starting again, then so be it.